Russ has been playing guitar since he was eleven. He said he used to do whatever his older brother would do, so when his brother began playing guitar, he picked it up as well. When he was 14, his brother gave up playing and sold him his equipment, and it was at that point he seriously pursued his love of music. Russ said he spent his "formative years learning rock and heavy metal through guitar tabs, videos" and anything he could "get his hands on." A lot of his favorite rock players from that time were also into classical guitar, which introduced him to the style. This eventually lead him to pursue and receive a degree in Classical Performance from the University of North Texas. Russ played, toured and recorded with various bands over the years performing original music and "trying to get labels interested enough to sign us." 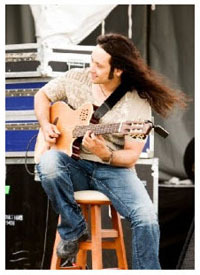 He said he parted with his last Rock band and in a meeting with his Producer Bob Parr, decided to record a CD which highlighted his "Nuevo Flamenco" guitar style. This eventually gave birth to Russ' debut CD "Bajo el Sol" (Under the Sun). Russ explains his style of play is "not true flamenco, jazz, Latin jazz, Cuban or Brazilian, but a fusion of styles, sometimes combined together simultaneously, and I do that without worrying about what particular rules go with each style." Russ says there is a "Latin/rumba base" to all his songs but each is unique in its own way. He said he wanted to "take what Ottmar Liebert started and expand on it." He saw an opportunity to get play-time for his music with Smooth Jazz Radio embracing "several artists in my style, such as Jesse Cook, Acoustic Alchemy, Lawson Rollins and, of course, Ottmar." "Local Texan rumba flamenco guitarist Russ Hewitt impressed us with his recording debut Bajo El Sol eight years ago and has been patience and particular with his steps since. Waiting three years to record his equally strong follow up Alma Vieja Hewitt avoided the sophomore slump and now it has been over 5 years for him to finally release his latest recording Cielo Nocturno. Keeping a creative streak is a difficult task for even the best of musicians and streaks are made to be broken. Clearly this is the case with Cielo Nocturno which is not of equal strength of his prior recordings but frankly exceeds all expectations from this artist that grows in his compositional capabilities." 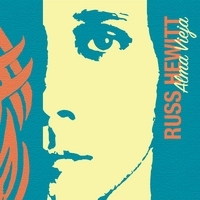 "‘Alma Vieja’ is the latest CD from guitar virtuoso Russ Hewitt and is replete with the rumba flamenco rhythms and lightning guitar runs that have become trademarks of his distinctive style. The project also includes a stellar line up of backing musicians including former Miami Sound Machine percussionist Raphael Padilla and drummer Walfredo Reyes Jr who in his time has played with both Santana and Ricky Martin. 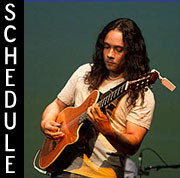 They are joined by bass player Bob Parr and exciting flamenco guitar prodigy Alfredo Caceres while other significant contributions come from contemporary jazz saxophonist Michael Lington and Grammy award-winning violinist Charlie Bisharat who has graced the stage with heavyweights such as The Rolling Stones Yanni and Aerosmith." "In many ways, I’m starting over," Hewitt explains. “New band, new music, a different way to approach music and a different target audience." His decision to go by his middle name is a reflection of this shift. "I’m ‘shedding old skin,’ if you will," he affirms.His latest release, Bajo El Sol, is a bright, fluid soft jazz with heavy overtones of the traditional Spanish style of flamenco. 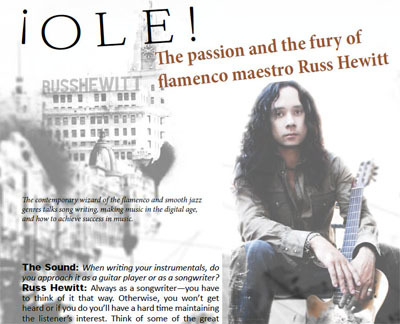 “Ironically enough, I’m not a flamenco player at all,” explains Hewitt, “not in the traditional sense like Paco De Lucia or Sabicus.” This style is called ‘nuevo flamenco,’ which Hewitt explains, “takes the ‘rumba’ style of flamenco, puts it into song form (intro/verse/chorus/solo, etc) and then adds melody over it." 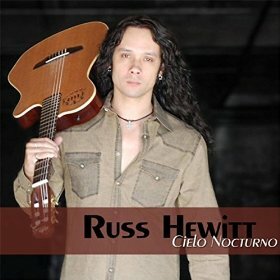 "Russ Hewitt mixes it up with a unique blend of neuvo flamenco, Latin and jazz styles that is flowing with passion and grace. The result is fresh, fluid, and captivating. Truly a master of the guitar, Russ Hewitt's music is not to be missed." "Russ Hewitts blend of Nuevo Flamenco and funky Latin beats is enough to make even the most conservative of people 'run' to the dance floor, yet at the same time perfect for smooth, easy listening. It's the best of both worlds, and I am waiting impatiently for the next offering from Russ Hewitt." 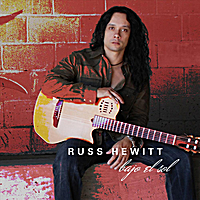 "Russ Hewitt stirs listeners musically with his strong Latin and jazz sensibilities with every track from Bajo el Sol. He's got some serious hooks. Wow! Russ Hewitt's is a wonderful entry where he brings the world's music together. Muchimos Gracias!"